In the last few months I’ve been posting a lot of entries related to some of the work I’ve been doing on the Westwind Globalization 2.0 Library. It’s been a long while coming and I’m happy to announce that the new version is now officially released at version number 2.1. What follows is a more detailed info on most of the same topics covered in the video. To get started in a Web Project it's best to install the Starter package, which includes some sample resources you can import and a test page you can use to test resources with. Once you're up and running and have had a chance to play with your resources – you can remove the starter package leaving the base packages in place. Please read or watch the video or read the the Installation Section of the Wiki or the Github Homepage all of which describe how to install the packages, configure your project , import existing resources (if any) and then start creating new ones quickly. Traditional ASP.NET localization supports only Resx resources which store resource information in static XML files that are compiled into the binaries of your application. Because resources are static and compiled they tend to be fairly unwieldy to work with when it comes to localizing your application. You have to use the tools available in Visual Studio or whatever custom tooling you end up building for managing resource stored in XML files and any resource changes require a recompile of the application. West Wind Globalization uses the same .NET resources models – ResourceManagers and ResourceProviders – and adds support for retrieving and updating resources using a database. Database resources are much easier to work when it comes to localizing an application and the library ships with a powerful Web based Resource Editor that lets you edit your application resources in real time as the application is running. You can force resources to be reloaded, so any changes become immediately visible. Using Database resources doesn’t mean that every resource is loaded from a database each time the resource is accessed. Rather the database is used to retrieve a given ResourceSet and locale as a single ResourceSet at a time just like Resx resources. Resources are then cached by the native .NET resource architecture (.NET ResourceManager or ASP.NET ResourceProvider) and stay in memory for the duration of the application – unless explicitly unloaded. Using database resources is no less efficient than using Resx resources except perhaps for the first load. If you don’t want to use database resources in production you can also import Resx resources, run with a database provider during development and interactively edit the resources, then export the resources to Resx and compile the resources for your production environment. It’s easy to import and export resources as well as creating strongly typed resources that can work with either Resx or database resources using Westwind Globalization. Switching between Resx and Db providers is as easy as switching a flag value. The goal of this library is to give you options to let you work the way you want to work with resources and to make it easier to add, update and generally manage resources. You can use the Web Resource editor or use the Code API, or the database directly to interact with your resources. If you have an interactive resource environment in production you might also like the Markdown feature that is built into the library that allows you to flag resources as being Markdown content which is automatically turned into HTML when the resources are created into a resource set. 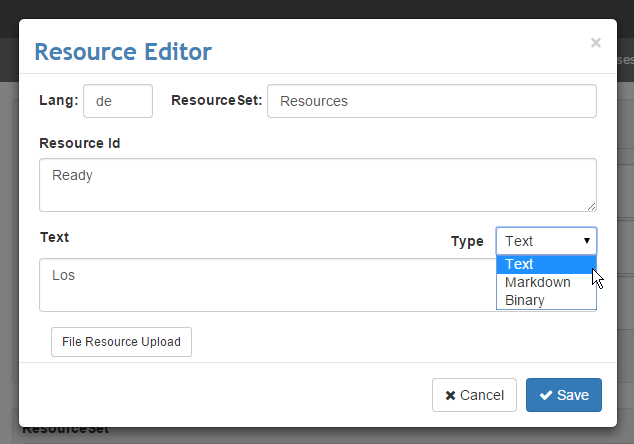 Combined with the interactive resource linking features this allows you use Db Resources as a poor man’s CMS where you can interactively edit content using the Web Resource Editor interface. The advantage of database resources for a typical Web application is that you can interactively edit and refresh resources so you can quickly see what the results of localizations look like in your applications as you are localizing. The previous version of Westwind.Globalization only supported MS SQL Server. A lot of feedback has come in over the years for support of other SQL backends. The new version adds multiple database providers that can connect your resources to several different databases by default, with an extensible model that you can use to hook up additional providers. Out of the box MS SQL, MySql, SqLite and SqLite are supported. You can also create your own providers and hook up any other datasource. Hooking up another relational Sql backends using ADO.NET can be easily hooked up by overriding a few methods that don’t fit the stock SQL syntax by override the DbResourceManger class. Other providers (like a MongoDb provider for example) would require a bit more work as the DbDataResourceManager API is fairly big, but allows hooking any kind of data from a database or anything else. As long as you can read and write the data store you can serve it as resources.Switching providers is easy as adding and requires only specifying the appropriate ADO.NET data providers, setting the DbResourceManagerType and providing a connection string. Unlike the previous version, all resources for a given ResourceID are displayed in a live and immediately editable format so you can make changes without having to click around. You can tab through the fields quickly and Ctrl-Enter saves a value so that you can work without taking your hands off the keyboard. The main editor and resource editor both support RTL languages and the editors autofill new resources with default values for quick editing. Translation using these translators isn't always accurate but I've found them to be a good starting point for localization. The Import (and Export) folder defaults to a project relative path. For an MVC project it assumes resources live in the ~/projects folder, for a WebForms project path is ~/ and the ~/App_LocalResource and ~/App_GlobalResources folders will be scoured to pick up resources. However, you can also specify any path that is accessible to the server here and load/save resources to and from there. What this means it's possible to import resource for any project from arbitrary locations on a development machine, edit them then export them back out which is very powerful if you need to localize resource in say a class library. In order to work with ASP.NET MVC strongly typed classes are a big requirement. MVC uses strongly typed resources for resource binding as well as for localized model validation messages so it's crucial that you can create strongly typed resources from the database resources. Visual Studio includes functionality to automatically create strongly typed resources from Resx resources, but the mechanism unfortunately is very tightly coupled to Resx resources – there's no easy way to override the behavior to load resources from a different source. So West Wind Globalization uses its own strongly typed resource generation mechanism, one that is a bit more flexible in what type of resources you can use with it. You can use Db Resources from raw projects (what you would use with MVC or a class library/non-Web project), from Web Forms (App_GlobalResources/App_LocalResources using the various ASP.NET Resource Provider functions), as well as Resx Resources. The dialog lets you choose a file name the classes are generated into (it's a single file) and a namespace that the resource classes use. Again the file specified here can be generated anywhere on the machine, but by default it goes into the project folder of an ASP.NET Web project. The class at the top is a static class that is used to allow you to specify where the resources are served from which is the DbResourceManager, AspNetResourceProvider or Resx. This static global value can be set at application startup to determine where resources are loaded from. Each resource class then includes a reference to a ResourceManager which is required for service Resx Resources. Both the ASP.NET provider and DbResourceManager use internal managers to retireve resources. The GeneratedResourceHelper.GetResourceString() method then determines which mode is active and returns the resources from the appropriate resource store – DbManager, AspNetProvider or Resx. but it's what makes support of the different providers from a single class possible which is nice. What's cool about this approach and something that's sorely missing in .NET resource management is that you can very easily switch between the 3 different modes – assuming you have both database and Resx resources available. 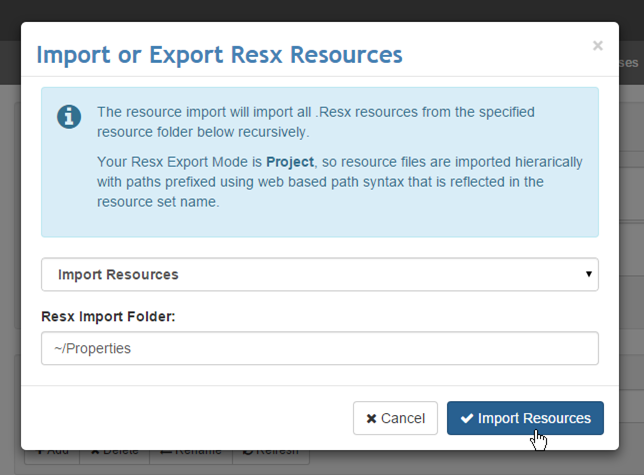 Given that you can easily import and export to and from Resx it's trivial to switch between Resx and Database resources for strongly typed resources. Although the library has always worked with ASP.NET MVC, the original version was built before MVC was a thing and so catered to Web forms, which was reflected in the documentation. As a result a lot of people assumed the library did not work with MVC. It always did but it wasn’t obvious. The main feature that makes ASP.NET MVC work with West Wind Globalization is the strongly typed resource functionality and you can simply use those strongly typed resources the same way as Resx resources. No different than you would do with strongly typed Resx resources in your MVC applications as long as you generate the strongly typed resources into your project. Note that this always works – unlike strongly typed resources you don't need to generate anything in order for resources to work so you can update Views without having to recompile anything first. You lose strong typing with this, but you gain the non-compile flexibility instead. DbRes also has DbRes.THtml() which generates a raw HtmlString instance in case you are returning raw Html. to get the raw HTML into the page. The new documentation on the Wiki has a lot more information and examples specific to ASP.NET MVC. This version has improved support for MVC with a new Strongly Typed Class Generator that works with either Resx or Database resources (ie. you can switch with a single flag value) as well a much more powerful resource importer and exporter that lets you use resources not just from Web projects but any project at all. As mentioned in the previous section one useful new feature is Markdown support for individual resources. 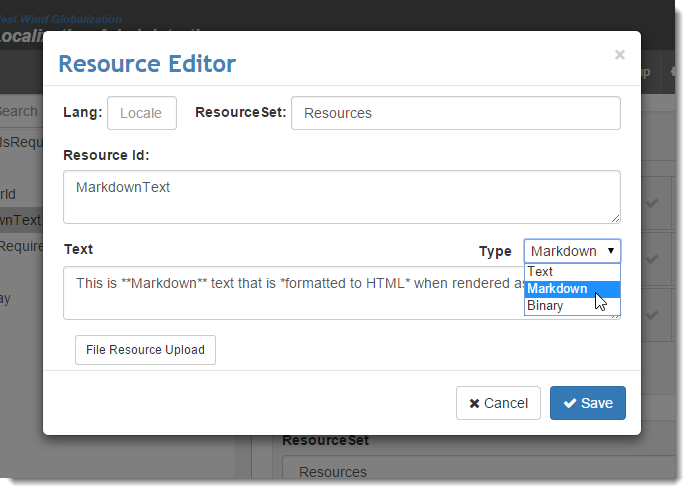 You can mark an individual resource to be a Markdown style resource, which causes the resource to be rendered into HTML when it is loaded into a ResourceSet or when you retrieve a resource value from the API. Note that this is a database specific feature. 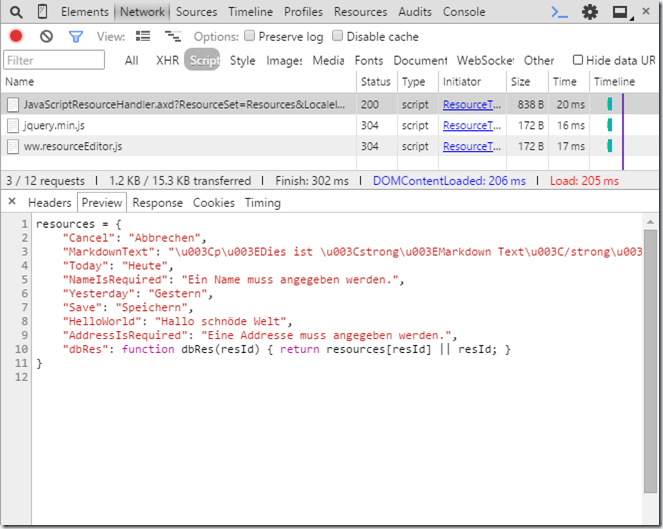 Once you export resources with the markdown flag to Resx, the markdown flag is lost and the data is exported as the rendered HTML string into Resx instead. If you plan on going back and forth between Resx and Db resources just be aware of this fact. This version also improves on the interactive resource editing functionality that allows you to create links to resources that can be directly embedded into your pages and can be activated when an authorized user wants to edit resources. Basically you can add a few markup tags to any element on the page that makes that element linked to a resource based on its resource id. This makes it possible to quickly jump to resources for editing. This is an especially powerful feature when you combine it with the Markdown features described above, as you can in effect build a mini CMS system based on this mechanism. On this page each element that has a flag associated with it is marked up with one or two mark-up tags. The key is the data-resource-id attribute which points at a resource id. data-resource-set can be applied either on the same element, or any element up the hierarchy to be found. Here I'm putting it on the body tag which means any attribute in the page can search up and find the data set. These attributes are used by a small jQuery component to find the resourceId and resourceSet and then open up the Resource Editor with the requested resources activated. If the resource doesn't exist a new Resource Dialog is popped up that allows creating a new resource with the resource name and content preset. editorWindowOpenOptions: "height=600, width=900, left=30, top=30"
For more info check out the in depth blog post that describes in detail how this functionality works and how it's implemented. 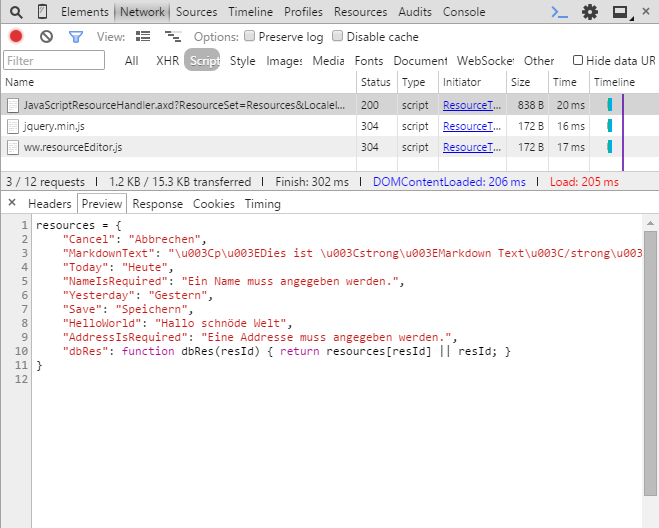 This creates the above value when accessing the page in the German locale. The first parameter is the name of the variable to create which can be anything you chose including a namespaced name (ie. globals.resources). The second parameter is the resource set to load. There are additional optional parameters that let you explicitly select a language id (ie. de-DE) as well as the resource provider type. The default is to auto-detect which checks to see if the Resource Provider is active. If it is resources are returned from the database, otherwise Resx resources are used (or attempted). 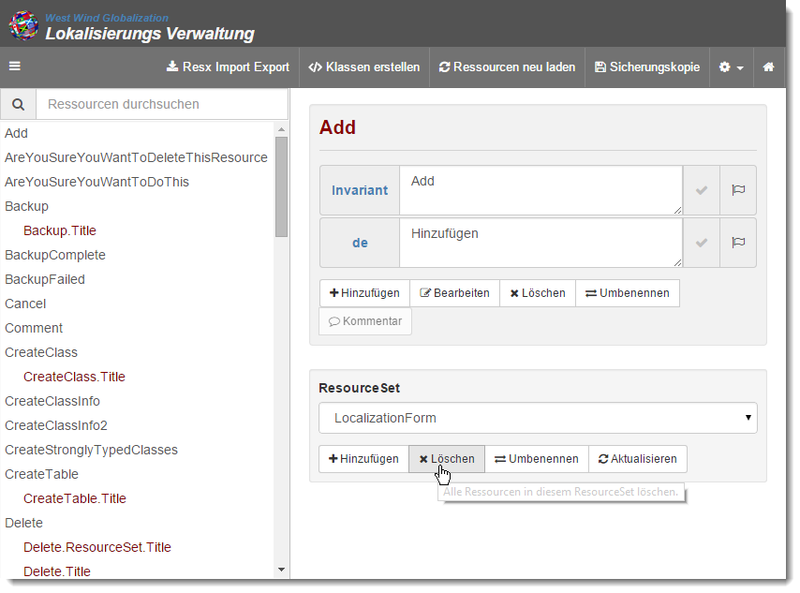 where view.resources holds the server imported resources attached to the local Angular view model. For more info on how the resource handler works check out this Wiki topic. As you can see there's lot of new stuff in Westwind.Globalization version 2.0 and I'm excited to finally release the full version out of beta. If you're doing localization and you've considered using database resources before in order to have a richer and more flexible resource editing experience, give this library a spin. If you run into any issues, please post issues on GitHub or if you fix up feel free to add a pull request. If you use the project or like it, please star the project on GitHub to show your support. Enjoy. Innovated ideas turned into a functional application. Localization is the future. Hi Rick. Thanks for the great work. Quick note. I think you may have a copy/paste bug in the blog text with respect to package names. @Tyler - thanks for the heads up. Yup it was late last night when I finally got this done! Hi Rick. and Thanks for remarkable effort. 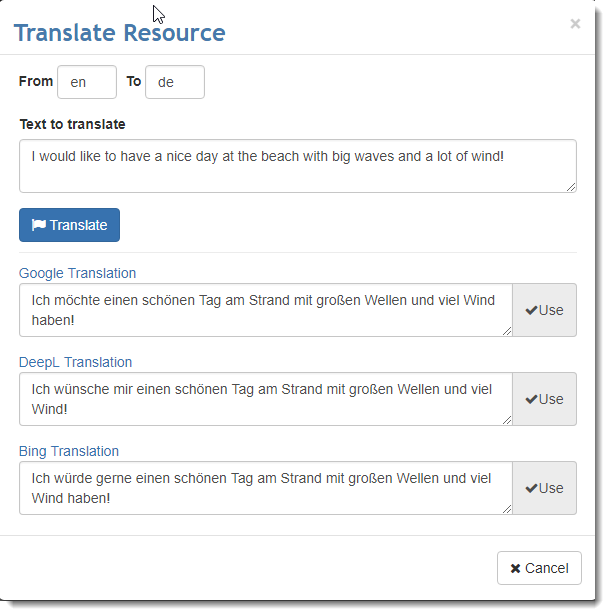 I want to suggest two improvements regarding to the Web AdminLocalization Interface. - The Selector of resourceSet on bottom is not so intuitive. I believe making it on the left side and presenting Keys/resourceSets in hierarchical view will be better. - The search only within the Current resourceSet, I beleive It is not best. because in real wold Projects we have to deal with multiple resourceSet, and not have to know each resource within which resourceSet before searching so searching on Whole will be great. And will be more cool if you offer search within content of strings not only the keys. @Amine - good suggestions. I have to take a look and see how feasible it is to have all resources in the list. We do need to know what the active resourceset is in order to perform some perfunctionary operations. I do however have a slightly more complex requirement..
As the project will be a multi tennanted application I would like to have your current solution with some extra functionality allowing the resources to be customised in a hierarchical way. e.g. application out the box should be multicultured / multilingual and every tennant gets that set of resources by default (set by sysadmin) - however if a particular tennant wishes to override a resource (potentially in multiple languages) they will have the ability to do that for only their views. Was planning on holding the tennantid as a session variable. Just to be really awkward I would like to further extend this idea of hiearchy as each of my tennants will poentially have multiple 'portfolios' winthin the application and I would like to have the concept of overrides at this level too. Again portfolio-id would be held as a session variable... If no overirde exists I would like to use the values specified in the next hiearchy level up. Would also want to cache as much as possible to prevent numerous db calls. Hi Rick, thanks for more this outstanding work. first of all thanks for this amazing work, but I would like to ask how is it possible to implement Globalization to ASP.NET5/vNext project as it changed a lot (for starters replacing web.config with config.json) and I am not able to get it functional. I already tried to add Westwind.Globalization.Web.Starter but to no success as there is no Configuration generated and no LocalizationAdmin accessible. @Jan - it's not going to work in ASP.NET 5 even when running with the full CLR runtime, due to the dependency on web.config configuration and HttpContext in many places. ASP.NET 5 hasn't even nailed down localization semantics yet. I think it'll be a lot easier to hook into the new pipeline (based on what the ASP.NET Team is talking about in their preview samples) but it'll be very different. In short the server side code will need a big rewrite to make it work. I will eventually port it, but the platform is so unstable at the moment that I don't want to waste my time. Very nice work Rick,i have been following & using your globalization library for past 5 years, it's a excellent update. I tried using the source code in my project with .net 5 (MVC 6) the DLLs are not getting referenced as it is showing version issue. ASP.NET core (MVC 6) is not supported at this time. You have to use MVC5 or earlier. ASP.NET Core is unreleased at this point and in an unstable state anyway - there's no reason to build anything with it in its current state. Thanks for the great library. I was wondering if you have any ideas or samples on how to have a build process create the strongly typed classes so we don't have to do create them manually. Since it seems we need context, I have not found a good way to do this. There's no direct way to automate in a build process, but all the interfaces that perform those tasks are available for you to create a small wrapper. Perhaps you can create a small console app or powershell script that automates the process and lets you build your resources. Maybe open an issue on GitHub so there's a reference for this as a feature request. 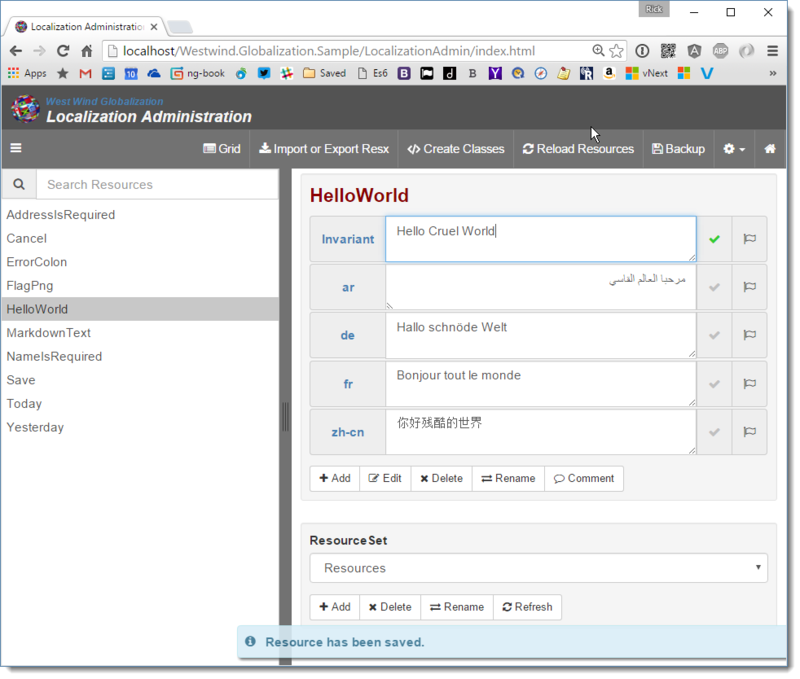 west wind globalization is compatible with asp.net devexpress tools. Isn't it? @Ayhan - there's nothing specific about any UI framework in this tool, so it should work yes. Does this support asp.net core 2.0? Yes - as of version 3.0 which was released a few days ago.